A spiral Perseid meteor shoots through the Heart Nebula, IC 1805, in the constellation Cassiopeia, August 12, 2016. The Heart Nebula lies only about 5 degrees from the Perseid meteor shower radiant, the location where the meteors appear to originate from. 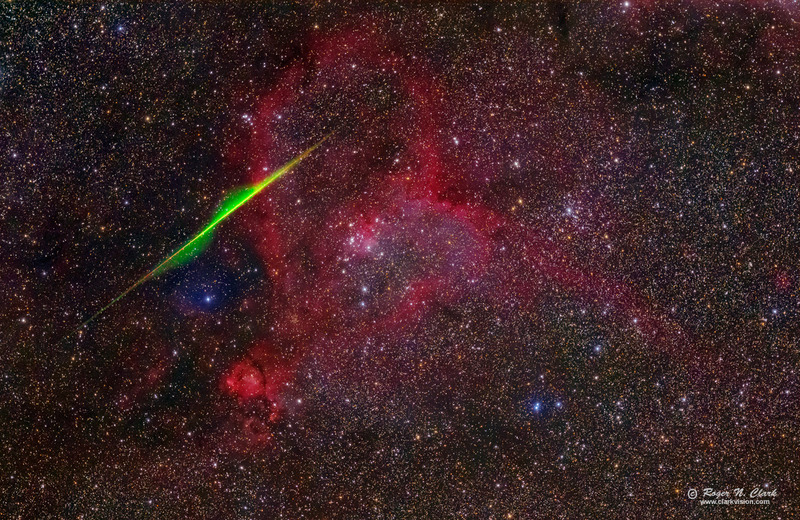 It is rare to catch a complete meteor in such a narrow angle image, and even rarer to catch such a beautiful spiral. The spiral must be caused by gases rapidly evaporating from one side of the meteoroid as it burns up in the atmosphere. This meteoroid is likely about the size of a grain of sand. The Perseid radiant is to the upper right and the meteor was traveling from upper right to lower left. The Heart nebula is a faint hydrogen emission nebula (H II region): glowing hydrogen emitting blue and red wavelengths with intervening interstellar dust, giving reds, magentas and pinks in natural color. Technical. Canon 7D Mark II 20-megapixel digital camera and 300 mm f/2.8 L IS II at f/2.8. Eighteen 1-minute exposures at ISO 3200 were added (18 minutes total exposure). No dark frame subtraction, no flat fields, no noise reduction. Tracking with an astrotrac. Seeing was terrible during the early morning hours of August 12, and while I took about an hour's worth of data, I threw out about 2/3's of the frames because they were too blurred from the turbulence. Even with only 18 minutes of exposure the combination of the efficiency of the Canon 7D Mark II and 300 mm f/2.8 lens collected plenty of light to make a nice image. This faint nebula demonstrates that the 7D Mark II is an amazing low light camera for it to record so much detail in this short exposure. Full size image is at 2.8 arc-seconds per pixel, and the image here is at a plate scale of 10.8 arc-seconds per pixel. A single 1-minute frame recorded stars a little fainter than stellar magnitude 17.7, and the 18-minutes of exposure reahes to a little fainter than magnitude 19. CEFA = 12700 minutes-cm2-arc-seconds2 (2.8 arc-seconds / pixel). Modern DSLRs like the 7D Mark II include on sensor dark current suppression and low fixed pattern noise at ISOs around 1600 and higher, making no need for dark frame subtraction. Modern raw converters correct for light fall-off and also correct for hot/dead/stuck pixels. This makes processing low light images easy: simply align and average. See my series on Astrophotography Image Processing and Image Sharpening for more details. The color balance is close to true color, meaning this is a stock camera with very close spectral response similar to the human eye. To learn how to obtain stunning images like this, please visit my Extensive Articles on Photography. See also Meteor Photography for information on how to photograph meteors, including the best lenses and strategies.